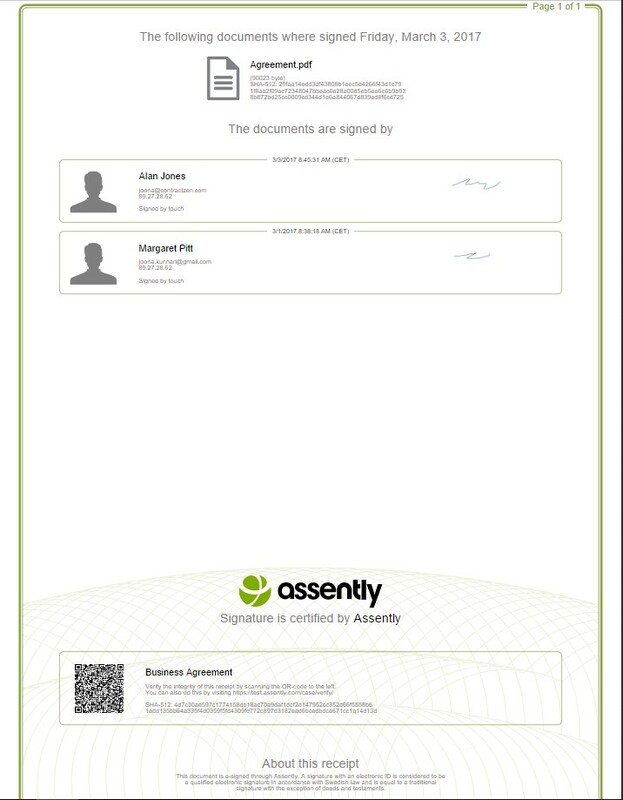 We offer Assently's (www.assently.com), Adobe Sign's (https://acrobat.adobe.com/us/en/sign.html) and DocuSign's (https://www.docusign.com/products/electronic-signature) e-Signature services. In addition, we offer Visma Sign (https://allekirjoitus.visma.fi/digital-signature/) to Nordic countries. All of them are seamlessly integrated into our service. We are constantly considering other e-Signature service providers as well, so in case you have ideas, please add them to our UserVoice Ideas & Requests page: https://contractzen.uservoice.com/forums/296202-general! We choose Assently as our first partner because our customers like their advanced signature methods, easiness of use and their affordable pricing. However, their approach is a bit different, because they add all signatures to the last page, as the placement of the signature in most cases is irrelevant to the validity of the signed document (both ways have the same legal validity). This way if you have, for instance, multiple documents within one contract, all pages are securely hashed (uniquely fingerprinted) and all the signers’ names are on the last page. This works in most cases and is extremely straightforward and clear to use. However, there are sometimes cases when users want to choose the placement of the signatures, and thus we integrated Adobe Sign and DocuSign into our service. Before you send the documents for signing with Adobe Sign or DocuSign, check the box "Customize document before sending". Then you are able to choose the place for the signatures and add custom fields for the signers to fill in. When signing with Visma Sign, you need to use strong identification i.e. local banking codes or mobile ID. Instructions to sign with Visma Sign can be found at https://allekirjoitus.visma.fi/digital-signature/. You can find instructions on how to sign with Adobe Sign in Adobe's web page: https://helpx.adobe.com/sign/how-to/for-signers.html. Assently instructions can be found at https://assently.zendesk.com/hc/en-us. In Adobe Sign you can verify that the document has not been modified by opening the signed document with Adobe Reader. It is not possible to add any additional fields to the document for the signers in Assently. Below is an example of an Assently signed document’s last page at the end of this message. So every document e-signed in Assently will have page that looks like this added in the end of the document. Our regular pricing ($9,50 or 8,70€/user/month, billed annually) includes, for example, contract management, meeting management and basic VDR for 30 days, but the e-Signing is priced separately. If you want to use Assently, you can choose a pre-paid package (10 documents) or a monthly subscription (5, 25, 50 or 100 documents). Both of them include certain amounts of documents but the number of signatures per document is not limited. In the pre-paid package there is no time limit but in the monthly subscription you will need to use the signatures during a month. If you want to use Adobe Sign you need to have an Adobe ID (https://accounts.adobe.com/). You also need to buy signatures from your Adobe account. After that, you can connect your existing Adobe account to your ContractZen account in our in-app Store. Please note: Adobe requires that you subscribe to the Adobe Sign Enterprise Plan in order to use it with ContractZen. If you want to use DocuSign you need to have a DocuSign account (https://www.docusign.com/products/electronic-signature). You also need to buy signatures from your account. After that, you can connect your existing DocuSign account to your ContractZen account in our in-app Store. If you want to use Visma Sign you need to have a Visma Sign account (https://allekirjoitus.visma.fi/digital-signature/). You also need to buy signatures from your Visma Sign account. After that, you can connect your existing account to your ContractZen account in our in-app Store. Whether you use Adobe Sign, Assently or Visma Sign, your ContractZen subscription has to be in force i.e. you can't e-Sign if your ContractZen subscription has ended. The prices of Assently signatures are approximately 0,90-1,5€+VAT/document. And in USD the prices are approximately $1-1,60+VAT/document. You can find Adobe Sign's pricing here: https://acrobat.adobe.com/ie/en/sign/pricing/plans.html, and Visma Sign's pricing here: https://allekirjoitus.visma.fi/digital-signature/.